While Seeger specifically referred to a qualifying diagnosis by a MAF physician, MAF diagnoses only started to be filed in large numbers during the second year of claims processing. The NFL has been waging a war on the “generally consistent” standard from the beginning. The first year of settlement implementation consisted primarily of pre-effective date claims; those of players who were diagnosed with a qualifying condition prior to the effective date of the concussion settlement. These claims were designated by §6.4 of the Settlement Agreement to be “generally consistent” with diagnoses obtained after the effective date of the settlement. Sections 6.3(d) and (e) of the Settlement Agreement define the doctors considered “legitimate” to make a diagnosis. 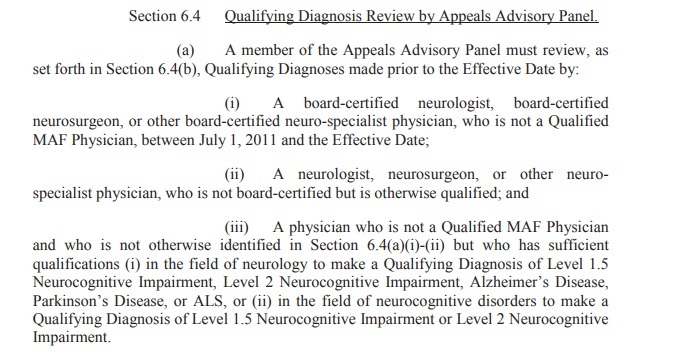 Section 6.4(a) Defines the manner in which the doctors and diagnoses would be evaluated regarding player eligibility for monetary awards, including designation of the Appeals Advisory Panel (AAP) to review the claims. Section 6.4(b) provides additional instruction including the diagnosis is to be based on “principles generally consistent” with the BAP. The settlement agreement specifically designates the diagnoses need not be identical. When settlement implementation began nearly two years ago the number of ALS diagnoses surpassed projections for the entire 65-year settlement term within a few months. Death with CTE claims were also higher than expected, along with those for Parkinson’s Disease and Alzheimer’s. The players were also being diagnosed much younger than projections indicated. While claims for these more readily diagnosed conditions were receiving approval during the first year of the settlement, very few dementia claims were being approved. The first claims report of 2018 indicates that out of 1,569 claims submitted, 206 had been approved, consisting of 53 Death with CTE, 20 ALS, 75 Alzheimer’s Disease and 34 Parkinson’s Disease claims. Neurocognitive Impairment Levels 2.0 and 1.5 (dementia) claims showed a very different picture than the previous diagnoses. 66%, or 1,040 of the 1,569 claims submitted were dementia claims; of those, only 24 had been approved with merely 6 dementia claims paid in the first year. 61 dementia claims had been denied at that point; the NFL had appealed 7 of the 24 approved claims, and many others were under audit. The first time the problems with dementia claim approvals surfaced was in August 2017, when attorney Patrick Tighe filed a motion seeking guidance from the court. By March 2018, Class Counsel Gene Locks filed a motion stating “the settlement was in danger of failing its execution” and requested permission to intervene. The settlement had been receiving a fair amount of bad press between the motions filed by Tighe and Locks, coming to a crescendo with the Locks motion. The pace accelerated somewhat on dementia claim approvals after that, appearing almost reactionary to quiet the press. Then the NFL decided to take control of the press narrative. The NFL upped its rhetoric in an attempting to turn public opinion and began making accusations of widespread fraud, requesting appointment of a special fraud investigator. Six months later in September, Judge Brody ruled in favor of the NFL. Apparently, he spoke too soon. The NFL has been going after players, lawyers, program doctors, and even the settlement Special Masters like a bargain-hunter on Black Friday. 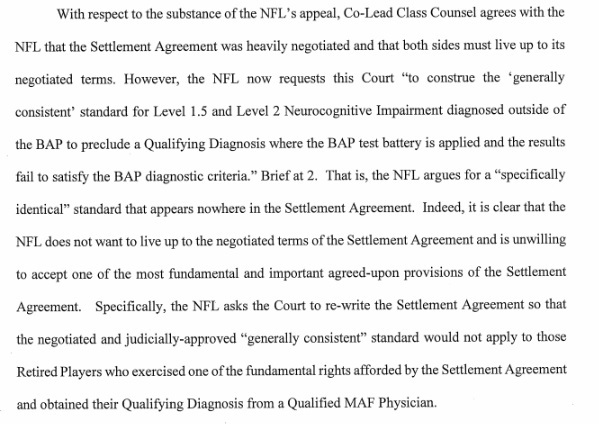 Much to the NFL’s dismay, not only were players being diagnosed with impairment outside the rigid structure of the settlement, but now diagnoses were being rendered by doctors agreed upon to perform settlement negotiated exams. Players have a choice in going through the free (as the NFL likes to emphasize) BAP program or they can alternately see an approved MAF physician. Many players have opted for the latter. Section 6.5 of the Settlement Agreement defines the role and required qualifications of MAF doctors. Section 6.3(b) designates that all diagnoses obtained after the effective date of the settlement must be rendered by a MAF or BAP physician. 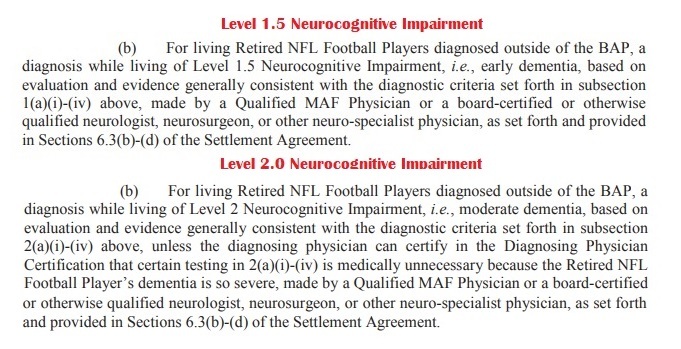 The settlement’s injury definitions permit a generally consistent diagnosis of Levels 1.5 and 2.0 Neurocognitive Impairment by MAF physicians. Any other diagnosis must be supplied by a MAF doctor. 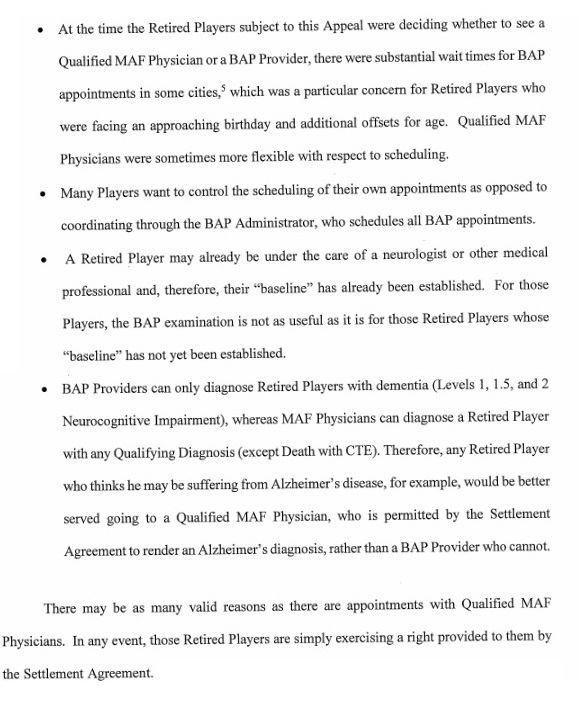 While many MAF physicians are also BAP providers and it isn’t immediately clear, the overlap since only a list of MAF physicians is available, and BAP exams are scheduled through the BAP administrator, the NFL accuses players who receive MAF rather than BAP exams of trying to buy a diagnosis. I’ve written extensively about the NFL’s aggressive and relentless attack on claims for the past two years. The NFL’s aforestated efforts to deny pre-existing date claims. The appeals filed regarding AAP and “generally consistent” are of themselves illegal appeals of Special Masters’ finding of fact. Huge pre-emption loss in the Dent painkiller lawsuit that weakened their thus far strongest defense. Attempts to rewrite the Aaron Hernandez timeline to make him a class member. Extremely quiet confidential settlements with, on information and belief, 33 opt-out plaintiffs. Holdings in other courts that statute of limitations is delayed for latent brain injury. If that’s not enough to convince you, consider their reactionary handling of domestic violence and player discipline. The NFL thought by omitting CTE and imposing very stringent criteria for settlement awards, that it had neutralized the issue of football related brain injury. 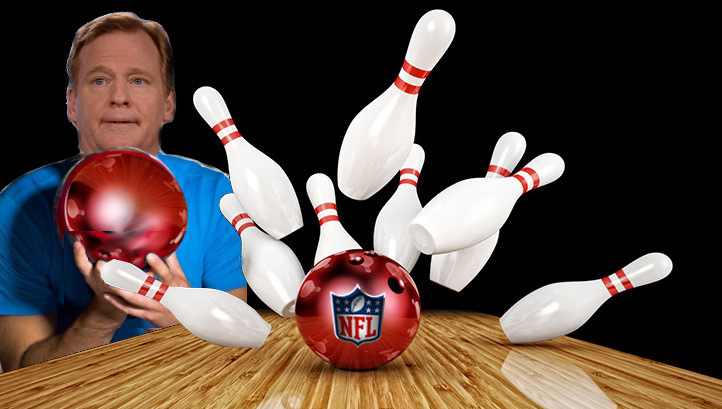 Nothing could be further from the truth, and the NFL is using every tactic imaginable to avoid a day of reckoning. As an MDL judge, Anita Brody has broad power to enforce and interpret the settlement formed and agreed to in her court. Will she rescue the NFL, or will she apply law judiciously and preserve the integrity of the settlement she oversaw and deemed to be “fair, adequate, and reasonable”? The fates of many are in her hands.